3.5 Million WordPress Blogs – 3 Barbados Blogs Have Top 100 Posts Today! 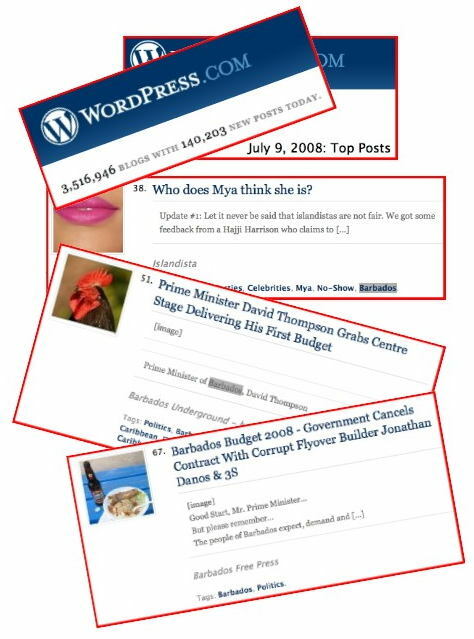 Out of over 3.5 million WordPress blogs and several hundred million WordPress articles online today, July 9, 2008, three Barbados blogs have articles in the WordPress Top 100 Most Popular Posts. Two Barbados blogs are also in the WordPress Top 100 Most Popular Blogs. That is worldwide, my friends! It is all the more astonishing when one considers that we are only a small island nation of 300,000 people or so and that over 150,000 new WordPress articles are published every day – adding to those hundreds of millions of articles already online. Early this morning 3 Barbados blogs had four spots in the WP Top 100 most popular articles! Number 38 was Islandista’s article about R&B singer/actress Mya Who Does Mya Think She Is? The #1 WordPress “Business News” article this morning was BFP’s Barbados Car Rental Agency “New Driving Permit Fee Will Be Devastating” authored by Adrian Loveridge. This does not even include the number of people who read the article at Barbados Underground where it was also published. 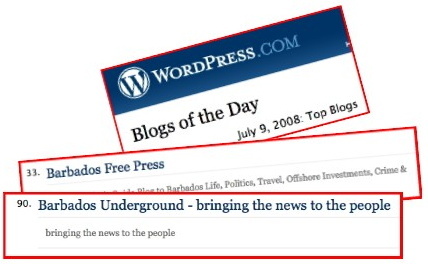 Out of 3.5 Million WordPress Blogs… Barbados Free Press & Barbados Underground are in the Top 100 Most Popular Blogs Worldwide! 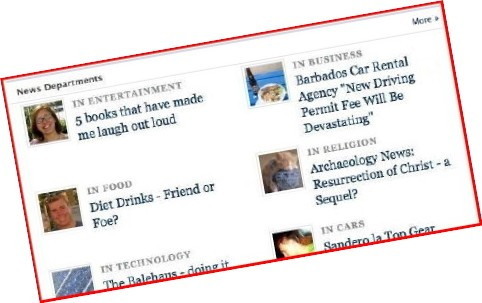 Yes folks, that’s right… out of 3.5 million WordPress blogs online, this morning Barbados Free Press and Barbados Underground were the #33 and #90 most popular blogs worldwide. This is undoubtedly due to the worldwide interest in the new Barbados budget by diaspora, governments and the international financial and investment communities. Believe us on this, Prime Minister Thompson… The eyes of foreign investors, governments, NGOs and the Bajan diaspora are upon Barbados every day through Barbados blogs. These people are already “engaged” by Barbados citizens participating in a free marketplace of ideas and ideals. And the important thing for you and your government to remember, Mr. Prime Minister… is that without a foundation of real and effective ITAL – Integrity, Transparency and Accountability Legislation and Standards – foreign investors, governments, NGOs and especially our own diaspora will be reluctant to provide the economic help this country is going to need in the coming tough times. ITAL, Mr. Prime Minister. ITAL and nothing less. It is a small world out there, friends – and when people plan their vacations and business trips online there is not much that remains hidden. This morning travelers at Trip Advisor.com are discussing the increase in car rental costs in Barbados due to the government’s massive one thousand percent increase in the price of a Visitor’s Driver Permit. There is no doubt that this discussion is also happening at other travel websites and forums. IF the government wishes to reconsider the increase, it had better do so quickly. IF the PM reconsiders and lowers the increase, he had better get his tourism staff on it right away to mitigate the damage being done to our travel industry as the word spreads on the internet. Give it a few more days and the travel sections of the major newspapers around the world will be picking up the story.